Artemisinin and some derivatives with activity against D-6 strains of Plasmodium falciparum were studied. Molecular electrostatic potential (MEP) maps were used in an attempt to identify key features of the compounds that are necessary for their activities, and then use those to propose new artemisinin derivatives. The partial least squares (PLS) method was then used to generate a predictive model. The PLS model with three latent variables explaining 88.9% of total variance, with Q2 = 0.839 and R2 = 0.935, was obtained for 15/6 compounds in the training/external validation set. For construction of the model, the most important descriptors were the highest occupied molecular orbital (HOMO) energy, atomic charges on the atoms O1 (Q1) and C3 (Q3), molecular volume (VOL), and hydrophilic index (HYF). From a set of 20 proposed artemisinin derivatives, one new compound (39) with higher antimalarial activity than the molecules initially studied was predicted. Synthesis of these new derivatives may follow the results of the MEP maps studied and the PLS modeling. Molecular electrostatic potential (MEP) (values in au) map computed from electronic density to the novel proposed artemisinin derivative (39). The red color indicates the 1,2,4-trioxane ring in the region of most negative MEPdue to the peroxide linkage characteristic of compounds active against D-6 strains of Plasmodium falciparum. We gratefully acknowledge the financial support of the Brazilian agencies Conselho Nacional de Desenvolvimento Científico e Tecnológico and Coordenação de Aperfeiçoamento de Pessoal de Nível Superior. 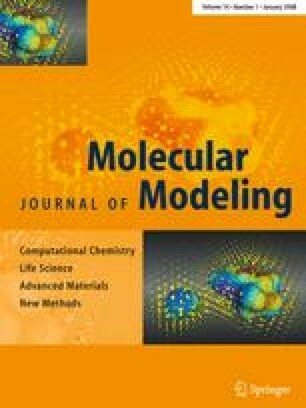 The authors would like to thank the Instituto de Química-Araraquara for the use of the GaussView software, and the Swiss Center for Scientific Computing for the use of the MOLEKEL software. We employed computing facilities at the Centro Nacional de Processamento de Alto Desempenho-Universidade Estadual de Campinas and at the Laboratório de Química Teórica e Computacional-Universidade Federal do Pará.